April, the month of showers(?) and the nights are drawing out nicely. In fact, with clocks going forward, it doesn’t get dark till well after eight o’clock. Jupiter still looms large in the south western sky at this time but it is getting lower now and has begun its retrograde motion. This doesn’t mean it is actually moving backwards, of course; it just appears to, as Earth passes it by. Having been nearly in a straight line with Aldebaran in Taurus, which is the red star below it, and the cluster of stars called the Pleiades above, it will move very obviously, on a daily basis, away from them towards the twins of Gemini above Orion. Make a note each time you see the red planet and watch it zoom across the sky. Look out for it especially on the 14th when a thin crescent Moon is close by. When it returns later in the year, it will be in the middle of Gemini. The dratted comet Panstarrs is still with us, sliding up past Pegasus, towards the W of Cassiopeia. You will now definitely need binoculars or, more likely, a telescope to see it. As soon as it has gone dark, centre stage now is the lovely constellation of Leo. Halfway up the sky in the south, it is very obvious and seems to rule over the spring sky. 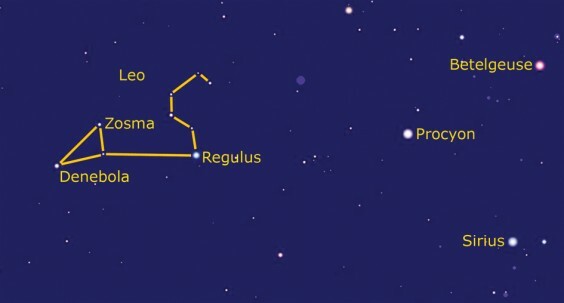 Indeed, its brightest star, marking the front foot, is called Regulus, derived from Latin for “king”, and its name in various other languages all make some regal reference. It can be seen that Regulus is the most luminous star in the constellation even though it is technically a dwarf – which just goes to show you can be bright regardless of your size. It is also a very busy little star, burning its hydrogen fuel so rapidly that it won’t last much longer and it’s spinning like a whirling dervish, rotating every 16 hours. At the other end of Leo, marking his tail, is Denebola, which means just that in Arabic. It, too, is spinning madly, only slightly slower than Regulus. Although it is much brighter than our Sun, it is only a little larger and it is known to have a dusty ring around it from which planets may have formed. Who knows? There may be an Earth-like planet there, upon which strange beings are giggling at the odd name they have given to our Sun. Above Denebola is yet another busy little star. It is spinning round twice a day and burning its fuel so rapidly that it will probably have a lifetime of one tenth of that of our Sun. It has the name of Zosma which is one my favourite star names. I know there is a ship with this name and, I believe, one of those chip thingies in a computer. Sadly, the literal translation from the Greek is “girdle”. Makes it sound as if Leo is getting a little paunchy.